Choices abound when it comes to how we purchase books: you can buy them at independent bookstores, from big box stores like Target or Walmart, or take the path of least resistance and click a button on Amazon. We’ve been taught to look for deals—and who doesn’t love the satisfaction of a good buy…with free two-day shipping? But, the way you purchase books makes a difference…for both the author, the local community and the future of publishing. Books are undervalued in today’s marketplace. There are many reasons for this, including 1) A saturated market where too many books are published each year; 2) It’s easy to get free books (libraries) and used books (bookstores and online); 3) Amazon provides books at such steep discounts (so much so that they often undercut their own profit). Supporting fair book pricing supports authors and local booksellers. Undervaluing books eats into the profit margins on books, making it difficult for small, independent presses to survive. It’s difficult for authors to make real money and continue writing, resulting in fewer, more homogenized voices in the marketplace. When you buy a $17 book from Amazon, Amazon takes 50% or more right off the list price (even if it’s sold to you at a discount – the usual is $11.50). The cut to the publisher is therefore less than $8.50, which is split between the author and publisher. Amazon has also introduced a third-party buy button system that is worrying many customers. As consumers, we have power when it comes to how we spend our money. It’s easier to buy on Amazon, no doubt—but it makes sense to consider your options and, when you can, support your local economy by shopping locally or shopping small to support the voices you enjoy reading. Purchasing books through the Shop pages on our websites supports women authors and small presses. We believe in being transparent with you: our readers and our customers. When you purchase direct from our sites, the store fulfillment service receives a 15% cut of the list price (as opposed to Amazon and bricks-and-mortar bookstores’ cut of 50% or more). Both our authors and ourselves as the publisher are making more money, which then goes back into bringing you more books by our authors. 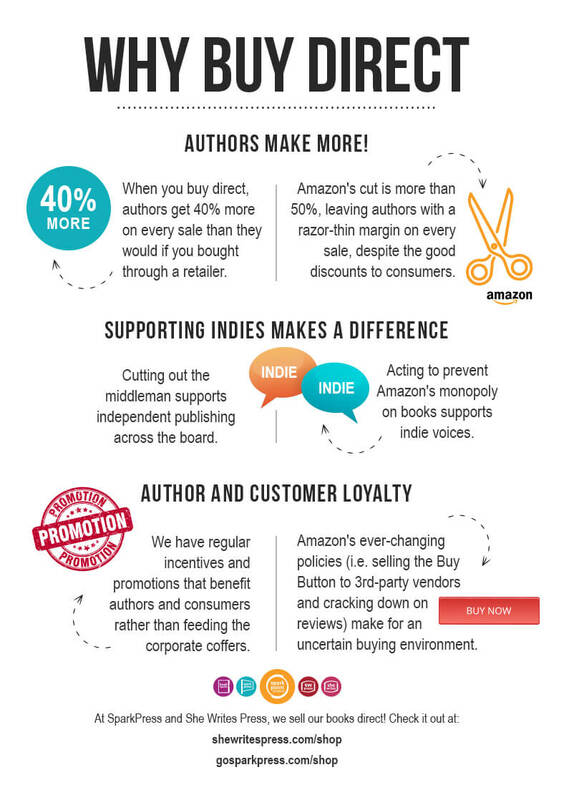 Contribute to a healthy book environment by supporting publishers and authors. Do this by buying your books at bookstores (even if it takes extra time or money) and/or by buying direct when you can. If you see that your favorite publishers are starting to offer branded bookstores online, try them out. See what the buying experience is like. Consider becoming a loyal consumer of a particular publisher whose books you like. We’re unaccustomed to doing this because we live in the era of the megastore (or in this case Amazon). Yes, they’re collecting data on you so they know what you like. Yes, they’re charging publishers for the privilege to push certain titles on you. Let’s choose agency over convenience, at least where books are concerned. It’s not just about authors getting paid slightly better—it’s about seeing that how we buy books has an impact on the future of books at large, and that we all play a role in maintaining a healthy book ecosystem where there’s more than just one player in town.